Tiffany 62' Custom Sportfish 1986 | "extravaganza"
62' Tiffany 62 Custom Sportfish 1986 "extravaganza"
(LOCATION: Jacksonville FL) This 62' Tiffany Custom Sportfisherman is one-of-a-kind. Tiffany Yachts is a small family run business specializing in highly customized, one of a kind yachts. The business dates back to 1934. They have built over 150 boats since that time, each one a unique custom designed craft. This example is sixty-two feet long and eighteen and one-half feet wide. Lots of room for some of the finest accommodations you'll find on a sportfisherman. You could hate fishing and still love this Tiffany. You step aboard Extravaganza into the finest cockpit you will ever see. Finished highly varnished natural woods with a large Murray Brothers fighting chair mounted in the center. Forward in the cockpit under cover is a piece of cabinetry housing the cockpit sink, freezer, and storage. It would look at home in many salons. Up the ladder brings us to an enclosed, air-conditioned bridge with centered helm station of handcrafted wood cabinetry. The captain and companion's chairs provide helm seating. The helm station features: Furuno Color FCV292 Video Sounder, North Star 951 Chart System, Furuno 61 Mile Radar, Icom M127 VHF Radio, Datamarine Depth Sounder, Sail Comp Digital Compass, Ritchie Compass, Clock, Intercom, Hailer, Wood Freeman Rudder Angle Indicator, Aft Fuel Level Indicator. Forward of the helm station is a wrap-around guest lounge. A refrigerator in front of the lounge provides cold refreshment. A complete refit in 2003 is apparent when you enter the salon from the cockpit. The salon is large, open, furnished in neutral colors and wood tones. There is a large L-shaped settee portside with wood coffee table and wood cabinet entertainment center. It’s the perfect place to relax or entertain. Forward and down we have the galley and dinette. The galley features: a Sub Zero Refrigerator with two Freezer drawers, a Kenmore Dishwasher, a Jenn Aire Stove with Oven, a GE Microwave, and an Equator Washer/Dryer in Pantry. Forward we find three staterooms. The master stateroom is portside with ensuite head with vanity and shower. There is a guest stateroom starboard with upper and lower bunks and a second guest stateroom forward with double berth. The guest head compartment includes vanity and shower stall. Head compartments were refitted with Galley Maid Heads during the 2003 refit. Five air conditioning units and two generators provide comfort and convenience on board. Extravaganza is powered by twin MAN 1100hp diesels for long-lasting dependable performance. She will cruise at 22 knots and has only 630 hours on the meters. If owning a one of a kind custom sport yacht appeals to your excellent senses call now to schedule a showing of this Tiffany Custom Sportfish. United Yacht Sales New Jersey would love to guide you through a personal showing of this 62' Tiffany 62 Custom Sportfish 1986. 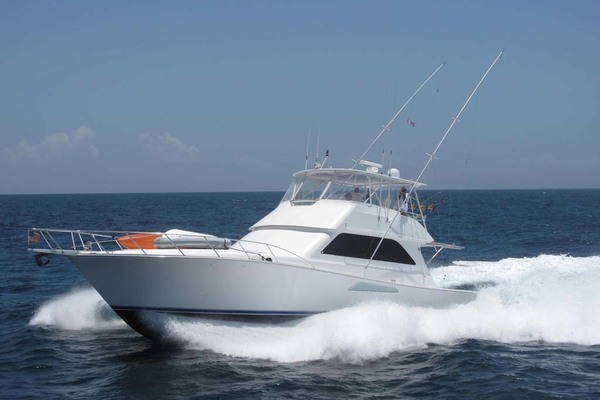 This yacht for sale is located in Jacksonville, Florida and priced at $329,000. For a showing please contact us by filling out the form on this page and we will get back to you shortly!